A look at how the Spa City has cared for its most treasured buildings. The historic preservation movement in the United States is often said to have begun with the fight to save Pennsylvania Station in New York City, which was demolished in 1963. For Saratoga Springs, the watershed moment took place in February 1968, when concerned residents came together to halt the attempt by a chain called Dutch Inns of America to build a 150-room hotel in the city’s beautiful Congress Park. The company was taking advantage of an ill-conceived piece of legislation conjured up by city fathers in 1957 to increase the dwindling stock of hotel rooms. Mayor James Murphy, Jr. created the Aesthetic Zoning Board (now the Design Review Commission) to oversee additions to (and subtractions from) the cityscape. City native Bea Sweeney and City Historian Evelyn Barrett Britten led the fight against the Dutch Inn. By the time architecture critic Ada Louise Huxtable wrote in the New York Times that Saratoga was “losing [the] race,” the motel plan was faltering and, within a year, the legislation was repealed. The preservation movement was underway. There had been earlier glimmerings of awareness and concern in the city. 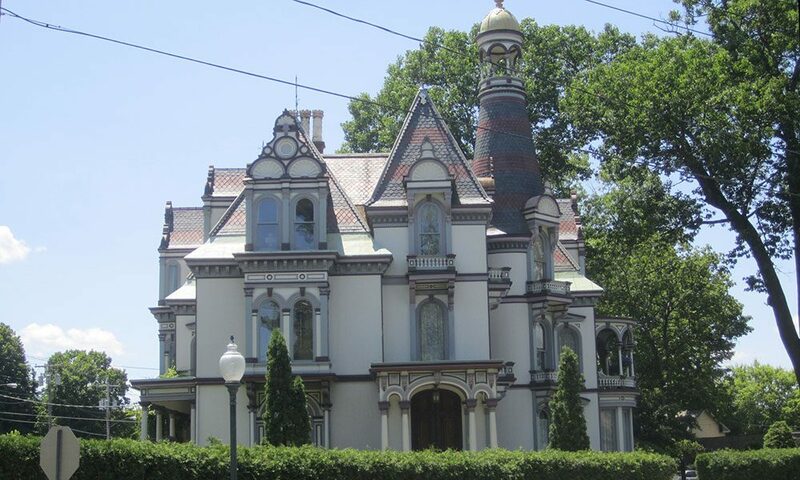 Late in 1965, preservationist John G. Waite, then a Columbia University graduate student, pointed out to the Historical Society of Saratoga Springs the importance of such landmarks as the Batcheller Mansion and Franklin Square. The following year, Sweeney, who was a member of the society, prepared a successful application to have Franklin Square listed on the National Register of Historic Places, a designation established by a 1966 federal law. The square was threatened by a proposed arterial highway, despite dogged opposition led by Broadway businessmen Norm Fox and Jack Berkowitz. During the 1970s, a number of additional crises galvanized Saratogians into creating one of the most successful preservation movements in the nation. During the planning phase for the nowdefunct Pyramid Mall just north of city limits, business leaders recognized that it would likely damage downtown shopping. A group of civic leaders initiated the Plan of Action to seek ways to revitalize downtown through community dialogue and planning. Urban renewal was well underway and alternatives to it had been given little consideration until Julie Stokes, a transplant from the Midwest, wrote to Mayor Raymond Watkin suggesting that federal grant sources be used for building restoration. Soon she was helping to form a historic preservation committee. When Watkins appointed Bernard Donovan, retired New York City schools superintendent, to run the city’s Community Development Program, Donovan hired Stokes to manage the preservation component. At the same time, city native and realtor John Roohan stepped in to market the 82 foreclosed Verrazano College buildings (the former Skidmore College campus centered on Union Avenue)—and did so successfully. Throughout this exciting period, a group of new young residents, including Mark Straus, Tom Gardner and Bob Bristol, chose Saratoga as their home and invested in downtown real estate, taking calculated risks—as did the Adirondack Trust Company, which loaned them the money. Pioneering individual investments included Bobby D’Andrea’s Old Firehouse Restaurant, Bill Van Bunscoten’s creation of the Downstreet Marketplace from a vast vacant storefront, Brian Dwyer’s rehabilitation of 328 Broadway, and Bob Israel’s extensive restoration projects in Franklin Square. On January 4, 1977, the city-funded Saratoga Springs Preservation Foundation was organized. It was deemed necessary in order to manage the initiatives for downtown resulting from the Plan of Action: the Façade Easement Program, through which grant funds were channeled to responsible property owners; the Special Assessment District, combining federal funds, sales tax dollars, and landlord contributions for downtown improvements; and the use of city funds for street scape improvement sand shade trees. In the same year, the city passed a stronger architectural review law. Although urban renewal was still leading to bulldozed buildings on both sides of Broadway, the events of 1977 represented a remarkable grounds well of support for preservation. Under the leadership of Stokes and her successors, the foundation hurled itself into a four-fold mission: education, technical assistance, advocacy and physical restoration. One of its early successes was a $43,350 grant towards restoration of the former Verrazano College buildings that had been sold to private owners. The foundation also secured funding—and provided the expertise—to save such important structures and features as a row of Second Empire houses on Clinton Street, the Adirondack Railroad terminal on Grand Avenue, the Gasholder Roundhouse on Excelsior Avenue, the Putnam Burial Ground, the Spirit of Life, and the Regent Street Theatre. It sought, and gained, federal recognition for seven historic districts, adding to three secured by Beatrice Sweeney. Its education program developed many components, including technical assistance, color charts, a marker program, organized tours, lectures and publications. The foundation opened a city visitors’ center in 1978 and, in 1986, transformed it into a unit of the statewide Heritage Areas program, capitalizing on the growing phenomenon of heritage tourism. By the late 1990s, historic preservation was widely acknowledged to be the foundation of the city’s resurgence, both as a livable city and as a popular tourist destination. National awards came in quick succession, three of them granted by the National Trust for Historic Preservation: the Great American Main Street Award (1996), the Great American Places Award (1997), and the Dozen Distinctive Destinations Award (2002). These were followed by federal designation as a “Preserve America Community” (2004). Another sign of progress at the millennium was the increasing initiative of for-profit developers in rescuing some of the city’s remaining at-risk buildings, notably the masterful adaptive re-use by Thomas Roohan and Sonny Bonacio of the Van Raalte Mill on High Rock Avenue, beautifully restored and converted to multiple uses in 1999. In the new century, the foundation continued to take a leadership role in two challenging but critical preservation projects. The Universal Baptist Church on Washington Street had been deteriorating rapidly, and by 1999 it was no longer safe. The foundation and several civic activists launched the non-profit Universal Preservation Hall, which secured funding for its restoration and conversion to a performing-arts center. And with that church stabilized, the foundation stepped in to assist the neighboring First Baptist Church with the preservation of its superb 1855-56 Greek Revival building. The fight is never over, of course. The foundation’s 2006 calendar spotlighted “12 buildings worth saving”—and by New Year’s Day 2008, three of them were gone: the early 19th-century Burgas Inn, the rear wing of the Rip Van Dam Hotel, and the former Hub on Church Street. But success follows success, and these days Saratoga Springs citizens agree on the importance of a strong historic preservation program. Studies have shown that each dollar spent on a Main Street Program (a communitydriven method of revitalizing traditional business districts) leverages $25.76 in new private investment. The Saratoga scene 40 years ago was one of illegal signs, unsightly billboards, rubble-strewn vacant lots, and vacant storefronts. The struggling city of 1970 has been given new and vibrant life by that winning combination of public and private money driven by the efforts of its own residents.